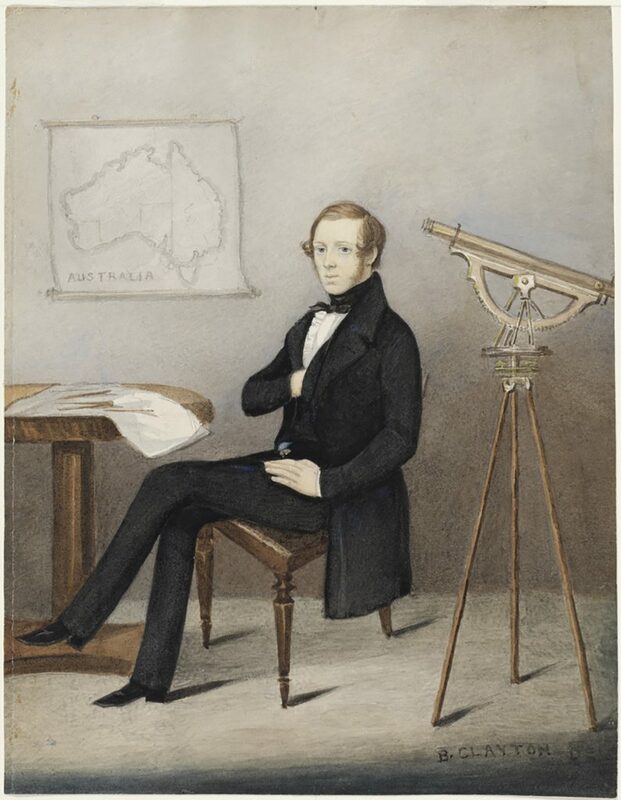 This left facing, full-length seated portrait depicts an unidentified surveyor, his profession implied by the theodolite, or surveyor’s level, positioned on the left. The subject is possibly Captain Charles Sturt, aged in his early 40s at the time the image was created. He is posed seated on a [cedar] side chair next to a small, round-topped table with a quatreform base and cylindrical ‘gun-barrel’ column in the style of the late 1830s-early 1840s, on which are laid a map, a pencil and a compass. The map on the wall shows the recently established colonies at Swan River, WA (after 1830) and Adelaide, SA (as proclaimed in 1834), and the eastern Australian colonies as yet unseparated. The sitter wears the type of dark clothes which would come to dominate men’s business dress after the mid-19th century. His elegantly-tailored three-piece, black wool suit is comprised of a single-breasted, full-skirted frock coat with notched lapels and sloping shoulder line – mirroring the silhouette of female fashions of the day – worn with a matching waistcoat and slim-fitting trousers strapped under the sole of square-toed shoes or boots. His watch and fob are just visible at the waist and he wears a snowy white linen shirt with a frilled front and a black neckcloth. His red hair is brushed fashionably forward in the romantic style and he is clean shaven with long side whiskers. From the turn of the 18th and 19th centuries ‘dandyism’ – defined as the outward manifestation of inner perfection – was characterised by fastidious attention to cleanliness of body and attire. This new development in fashion set the standard in masculine dress, ushering in an era of perfect plainness, understated elegance and refinement which brought a new ethic of restraint into men’s dress. Captain Charles Napier Sturt (1795 – 1869) arrived in Sydney with a detachment from the 39th regiment, aboard the Mariner on 23 May 1827, escorting convicts to NSW. Keen to explore the Australian interior, especially its rivers, Sturt led several expeditions into the interior of the continent, starting from both Sydney and Adelaide. Returning to Britain in 1832-35, he applied for a grant of land intending to settle in Australia. On 20 September 1834, he married Charlotte Christiana Greene. The couple returned to Australia in mid-1835 to begin farming the land granted to Sturt near present-day Canberra. In early 1839, after returning to NSW to settle his affairs, Sturt and his family took up residence in South Australia. The artist B [enjamin] Clayton (1805 – 54) was a watercolourist, and possible cartoonist, thought to have been a medical practitioner. The only son of the artist Samuel Clayton and his first wife, Jane Maguire, he studied medicine in Dublin from 1826 until his return to Australia in April 1830, where he married Frances Matilda (Fanny) Broughton, in 1834. They settled at Baltinglass, near Gunning, where several children were born. Subject is seated on a [cedar] side chair with a surveyor’s level, or theodolite, on the left, mounted on a wooden stand.